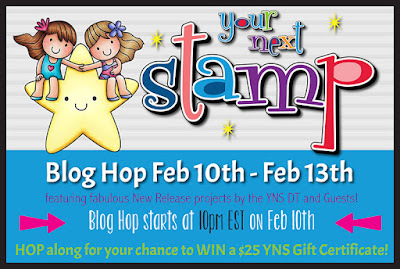 Your Next Stamp February New Release Blog Hop! Hello! 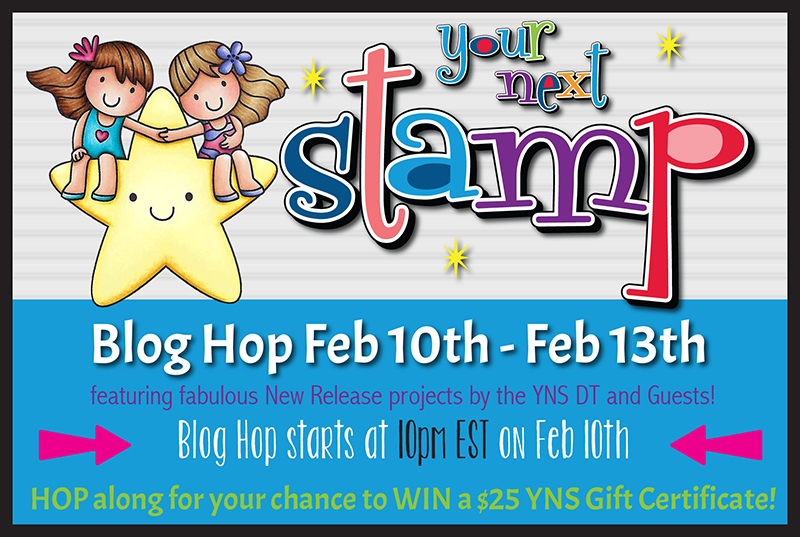 Welcome to the Your Next Stamp February New Release Blog Hop! There is so much cuteness being released this month, and you won't want to miss all of the amazing inspiration found along the hop! 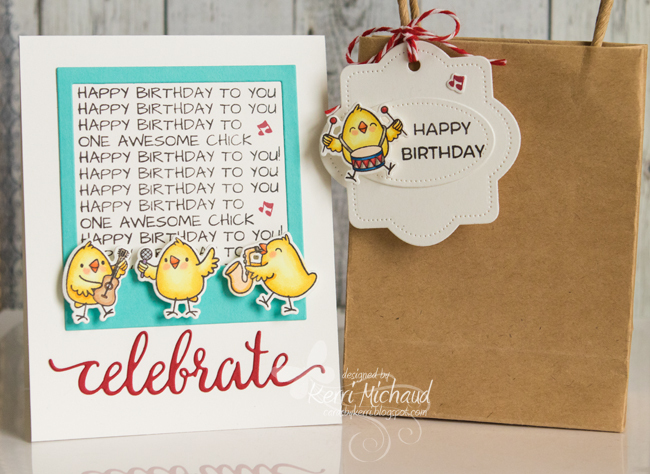 I am using my favorite set being released this month for my project today called Music Chicks! So adorable and fun!!! To make my card, I started by stamping the happy birthday song sentiment onto a piece of white cs using my Mini Misti Stamping Tool to line it up. I then framed it with the original InstaLove Polaroid Die. The current ones have stitching detail which I love even more! I colored all my sweet chicks with Copic Markers and cut them out with the coordinating Music Chicks Dies. I then popped them up with foam tape over my frame. 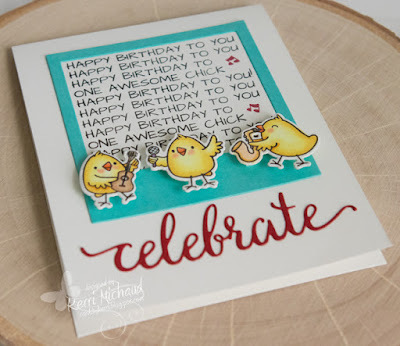 I used the Fancy Celebrate Die to cut the celebrate sentiment out of red cs. 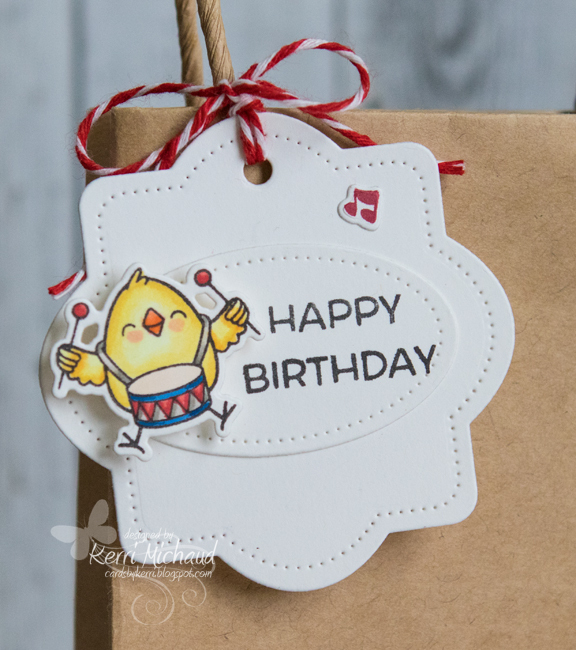 For the little tag, I used the new Cool Tag Five Die Set and added one more darling chick as well as a sentiment from the new Woodland Jessica Stamp Set. Very simple! Make sure you take advantage of the special new release sale-20% off your entire purchase now through February 15th at midnight EST!!! Those chicks!!! Loving them!! 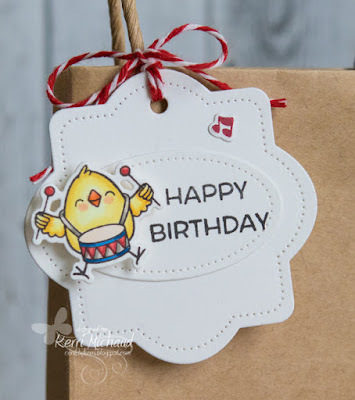 Super cute card and tag!! A great card and tag Kerri, the Music Chicks are so sweet. Well done. The tag shape are great, i have not seen any that shape. Love the cards very talented. Cute set. Love the music theme. Love your sweet projects those little chicks are so adorable. Your music song background is lovely and that tag is awesome too. Wonderful card and tag Kerri! So cute. It is great to have you back for the month! 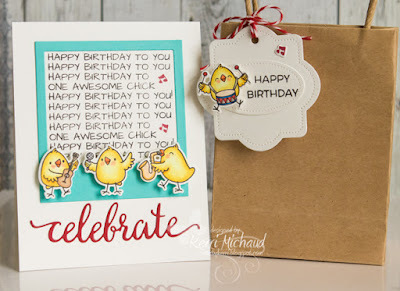 Those chicks are so cute...great card design and tag! Adorable card and tag. Gotta love those chicks - so cute! Sooooooo adorable!! Those little musical chicks are so cute!! And the sentiment is super fun! those super sweet chicks. Beautiful card & cute tag. to himself on the tag was a fun idea. those chickens are so cute! These chicks are so cute!!! Beautiful card and tag. Love the chicks. Fantastic cards! I see why the music chicks are your favourite - so adorable! Fabulous! Love these chicks in this set. Thanks for the inspiration. Oh my ! How cute are these little chicks ! !